This year-end report details our accomplishments during our 10th anniversary year and looks forward to the future as Positive Impact New York continues to build on our success and prepare for a big year in 2014. In the following pages, you will see the results of the hard work and dedication put forth by our staff, families and the community. You will also read about the tireless efforts exhibited all year long by our amazing supporters.! In 2013, we continued the growth of our “Positive Impact Projects”. The Positive Impact Projects consisted of three components: The Positive Impact Basketball Academy, The Blackboards and Backboards Student-Athlete Academy, and the Capital District Classic. The Basketball Academy provided skill development to student-athletes throughout the Capital Region from k-12 through rigorous basketball workouts designed to improve each player’s overall skills. The Blackboards and Backboards Student-Athlete Academy expanded to over 40 student-athletes in grades 6-8 with basketball skills and life skills workshops to assist them in the college recruiting process. Last but not least, the Capital District Classic provided a platform to the top 40 junior high players in region in an all-star game setting. By expanding our programs, we not only improved our community base, but more importantly provided more meaningful outlets for our youth.! In 2014, we will look to continue to improve ways to develop tomorrow’s leaders. To do this, we need your help. Whether it’s volunteering at our Blackboards & Backboards Student-Athlete Academy, or sponsoring our Capital District Classic, we will continue to scale Positive Impact New York with your support.! I wish you all much happiness, great health and success in 2014. I am fortunate to serve you and our youth!! ELEVATE! SHOP RITE! SLAM MAGAZINE! INDIVIDUAL SUPPORT! SHAUNTIA VERONA! SAKYNA COLEMAN! JONATHON THOMAS! DERICK BROWN! DARRYL WILLIAMS SR.! 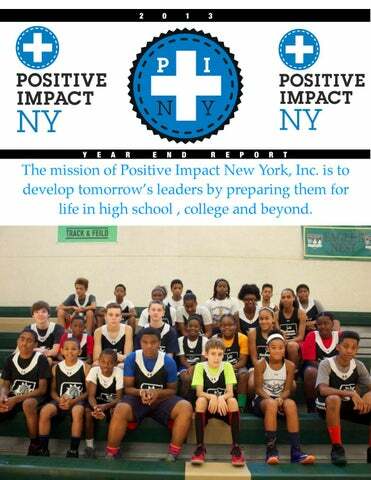 Positive Impact New York, Inc. hosted its inaugural Blackboards & Backboards StudentAthlete Academy.! Positive Impact New York, Inc. created “The Capital District Classic” to give Capital Region student-athletes a platform to showcase their talents. Some of the area’s top basketball players will participate in this annual event that promises to be around for years to come.! The purpose of the program is to encourage participation in sports, as a way of! encouraging and advancing excellence in academics. Developing constructive personal goals and providing an extended family to assist our student-athletes in becoming valuable contributors in their! communities by identifying the requirements and opportunities in the Higher Education process early in the academic timeline of the individual. Positive Impact New York hopes that “The Capital District Classic” will ignite the energy and passion of youth basketball in the Capital Region and bridge the gap between the Capital Region’s basketball legacy and the current youth basketball experience while providing an improved platform for competition and exposure. We at Positive Impact New York are committed to developing the total student-athlete. Taylor Mulvey is the epitome of the total student-athlete. Taylor played his high school basketball at Christian Brothers Academy in Albany under Dave Domel. After graduation, Taylor attended St. Thomas More as a post-graduate. From there he signed with NCAA Division II Barry University... Taylor is now attending New Paltz college where he will graduate with a college degree. Taylor is a great example of a young man who was focused and committed to his goals. His focus will turn into a college degree and successful life.